With public housing in Millers Point, Dawes Point and The Rocks again under threat of sale a group of interested locals formed a group called CoRE following a community meeting. They undertook a detailed investigation of the options for saving the areas historic public housing. The study by Freya Bundey entitled Millers Point, Dawes Point & The Rocks: Living communities presented two options to a community meeting in September 2013. Below is an edited version of the report which raises a number of issues relevant to the broader public housing community in the inner city. Dating back to the Victorian era, Millers Point, Dawes Point and The Rocks form a small City of Sydney precinct located on the Sydney harbour foreshore. The closely connected community is the oldest surviving continuous urban residential precinct in Australia’s European settlement, and has provided a home to generations of local workers and public housing tenants. The ABC’s Hindsight program described these suburbs as a “small and feisty Maritime community living at the foot of Sydney Harbour Bridge”. Millers Point has been listed on the State Heritage Register since 2003 as “a living cultural landscape greatly valued by both its local residents and the people of NSW”. The register recognises both the pristine physical geography of the area, and also the unique and intrinsic value of the community identity. Many of those living in the precinct are long-term residents, while others were born in the community and have a history of family connection to the place. As of 2011, almost half (47%) of the community were over 50 years old. The close bonds between community members, and the irreplaceable connection to place, have been fostered over years, if not generations. 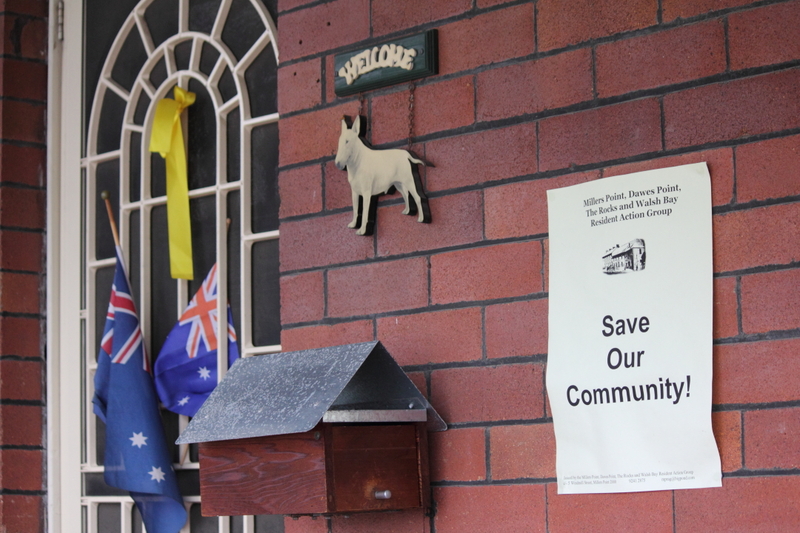 It is this “locally-distinctive and self-sustaining” community, as recognised on the NSW Heritage Register, which is threatened by current proposals. In 2012, the NSW state government Finance Department commissioned a review by the Land and Housing Corporation (LHC) into the possible sale of the 208 heritage-listed social housing dwellings in and around Millers Point. Former Minister for Finance Greg Pearce has attempted to outline the economic benefits of selling “underperforming” housing stock to address concerns of “long-term viability”. Such private sale of public housing would result in the dislocation of the approximately five hundred local residents, with severe social costs for the community at large. At stake is the intangible social cohesion and support provided through the local and informal networks, and the irreplaceable connection between ‘point people’ and the area. This is not the first time that private sales have been proposed. In 2006, the NSW State government sold 16 houses on 99-year leases. At the time, residents were told that the proceeds of sale were going to be used for maintenance and restoration of the Millers Point properties. This has not occurred. The initial sale was followed by a further 20 properties in 2010. In both cases, government Ministers promised that these were ‘one-off’ sales, and would consist solely of vacant properties so that existing tenants would not be affected. The second round of sales also came with the promise that the proceeds would fund public housing elsewhere. The government is yet to offer any hard evidence of this occurring. To assess the consequences of the current proposal, Greg Pearce commissioned CRED Community Planning to prepare a Social Impact Assessment of: “the potential social impacts that may result from the NSW Land and Housing Corporation’s evaluation of social housing and any further sales of social housing”. Such social impacts would be severe and long lasting, for both the local residents and the broader community. That the properties remain under the management of Housing NSW, which commits to the restoration and conservation of the properties. This model requires minimal transitional costs and allows for the retention of complete public ownership and maintenance of the properties. Its success would depend on improving the accessibility and accountability of Housing NSW to the local residents by the setting up of a mechanism to ensure funds do not go directly to consolidated revenue but are hived off at time of sale and can be tracked to specific maintenance and that none of the funds be used to pay for any bureaucracy that will administer the work. That the properties be leased to a Community Tenancy Association (CTA), which ensures the restoration and conservation of the properties and that the leases be of a term long enough (e.g. 35 years minimum) so that the Community Tenancy Association can have enough control over the assets that they are able to be used as collateral for leverage of funds for new development and that any tenant who wishes that their tenancy not be transferred to a CTA has the option of remaining with Housing NSW. Leasing to a Community Tenancy Association is consistent with the NSW State government’s current political agenda. In April this year, 1300 public housing properties had already been transferred to community groups to afford the not-for-profit providers greater capital in order to borrow money from the private sector and thus allow for more social housing. CoRE is in principle opposed to the selling off of public housing, especially in light of the Auditor General’s Report Making the Best Use of Public Housing which states that the selling of houses to fund new development is financially unviable. CoRE is especially opposed to the sale of any 1, 2 or 3 bedroom dwellings as the Community regards them as fit for purpose regardless of the amount of backlog maintenance required. CoRE is however open to the possible controlled sale of a specific number vacant dwellings where the cost of restoration is the greatest, the use to the Community is the lowest and the sale value the highest, with the proceeds of sales going directly towards the maintenance and restoration of the properties and that after the targeted dwellings have been sold to fund maintenance backlog further sales cease indefinitely. According to CoRE’s estimations there are currently 40 vacant dwellings in the area. We do not support the sale of any one, two or three bedroom dwellings in the area as these are of most use to the Community. Nor do we wish to endorse any move which would result in the forced removal of tenants from any property where a case can be made for staying (eg long term residency, medical reasons, appropriate use of space/s). CoRE’s proposal is focused on the current lot of vacant homes which are larger and would be most costly to Government to renovate and convert to multiple occupancy dwellings. The disposal of these properties would then bring the average cost of backlog maintenance down for the remaining properties. The consulting company Sphere has undertaken financial modelling of CoRE’s proposals, based on LAHC data (see subsequent section). Sphere’s modelling demonstrates that with the sale of some housing, CoRE’s models – including restoration and upgrades – can be economically viable over a five year period, and indeed preferable to the proposed sale of housing given the involved re-housing and administration costs. This model would allow for an initial substantial investment in renovation/restoration works, while the continuing rent revenues would fund ongoing operations. CoRE’s proposal is timely as we understand that LAHC reports a budget shortfall of $330,000,000 and that in order to make savings they have been reducing maintenance and upgrading of existing homes, reducing capital programs and selling properties. The Auditor General’s Report Making the Best Use of Public Housing asserts that these practices, including the selling of properties are not financially viable. Sphere’s figures show that there currently exists an average maintenance backlog per dwelling of $310,000. Added to that is the reality that as they are heritage listed historic houses and further neglect in maintenance will cause an exponential blow out in restoration costs as the building deteriorate at a more rapid rate due to their current state of neglect. CoRE’s proposal addresses the existing maintenance expense and the burgeoning expense into the future in a cost neutral way by allowing for the proceeds of sale to go directly to addressing the maintenance and bringing back the properties to a standard that ensures their viability into the future hence creating savings. CoRE’s alternative proposals provide a solution whereby the NSW State government can both meet its fiscal requirements and protect the intrinsic social value of the community. In line with the government’s Conservation Management Guidelines and its commitment to the provision of public housing, these models preserve the mental health and physical wellbeing of the residents, the vibrancy of the community, and the precinct’s historic architecture. Since 1996, New South Wales has been transferring some property management to community housing providers, and more recently, title transfers. This facilitates the growth of the Community Housing sector. This outsourcing trend follows similar directions in other Australian States and Territories. Furthermore tenants leased under Community Housing are eligible for Commonwealth Rent Assistance that goes directly to the tenant and is recouped by the Community Housing Provider, which helps them operate at a profit. This payment is not available to public housing tenants and so cannot be recouped. In New South Wales, titles to 3,099 dwellings have been transferred to Community Housing Providers. Title transfers to a further 2,921 properties are planned. The combined value of all these dwellings is reported to be almost $1.5 billion. The New South Wales Commission of Audit reported in May 2012 that as part of the transfer the Community Housing Provider sector has committed to deliver 1,200 new social and affordable housing properties over ten years. This will be financed by leveraging the housing assets against borrowings. Community Tenancy Associations Women’s Housing and Bridge Housing already provide some Public Housing in the precinct. Residents interviewed for this report reflect positively on these arrangements. For example, Susan O’Brien notes that whereas the exterior of her property is managed by Housing NSW (as outlined above), the interior of the property and repairs to plumbing are managed by Women’s Housing. In relation to internal repairs and in contrast to external requirements, Susan notes that internal maintenance “is completed within a week at the outside and with complete satisfaction”. This article has been edited by Geoff Turnbull. The full CoRE submission can be viewed here – Millers Point Social Housing Proposal CoRE Oct 2013.